Okay, I will go ahead and send you the entire training course – all 10 lessons together in one file – in PDF format as an attachment to this e-mail. You can then download the attachment, save it on your computer, and read through the 10 lessons at your leisure, taking all of the time you need to go over the information and absorb the material. As you do so, it will be your job to contact me via e-mail whenever you have any questions or concerns about the material in the lessons, and I will then do my very best to answer all of your questions and clarify everything for you. And I will also be relying on you to keep me updated when you select the aquarium system you will be using, or make any changes or additions to the tank, so that I can keep the information in my records regarding your particular seahorse setup current and accurate at all times. That will allow me to give you the best possible guidance and assistance as you go along. All we ask in return is that you stick with the highly domesticated Ocean Rider Mustangs or Sunbursts when you are finally ready to add ponies to your tank, Jessica, just as you are planning on doing. As you know, Mustangs and Sunbursts are the perfect ponies for beginners. They are hardy, highly adaptable, easy to feed, and perfectly adapted for aquarium life — the world’s only High-Health seahorses, guaranteed to be free of specific pathogens and parasites. Be sure to save the PDF file with the seahorse training lessons on your computer for future reference, Jessica. It includes a detailed table of contents with page numbers, so that you can quickly locate the material or section you would like to go back and review at any time. Just remember that the lessons are for your eyes only, Jessica, with the obvious exception of your husband and any immediate family members who may be helping you with the aquarium are the care of the seahorses and other fish. Please don’t share the PDF file with the complete training program or the individual lessons with any other hobbyists or individuals without first obtaining my expressed permission to do so. Thanks for your cooperation! Best wishes with all your fishes, Jessica! Pete. We just returned from Kona where we visited the farm. We are excited to go through the training program. I am writing in hopes that you are still teaching your online course entitled: Seahorse Training Program — get certified now! Please let me know, and if you are I will email back (off this forum) with my demographics as they relate to this course. I have also set this to your email. Yes, indeed – the seahorse training program is always available free of charge to all Ocean Rider clients and customers. Okay, BJ, to get you started off on the right foot, I will go ahead and send you the entire training course – all 10 lessons together in one file – in PDF format as an attachment to this e-mail. You can then download the attachment, save it on your computer, and read through the 10 lessons at your leisure, taking all of the time you need to go over the information and absorb the material. All we ask in return is that you stick with the highly domesticated Ocean Rider Mustangs or Sunbursts when you are finally ready to add ponies to your tank, BJ, just as you are planning on doing. As you know, Mustangs and Sunbursts are the perfect ponies for beginners. They are hardy, highly adaptable, easy to feed, and perfectly adapted for aquarium life — the world’s only High-Health seahorses, guaranteed to be free of specific pathogens and parasites. Be sure to save the PDF file with the seahorse training lessons on your computer for future reference, BJ. It includes a detailed table of contents with page numbers, so that you can quickly locate the material or section you would like to go back and review at any time. Just remember that the lessons are for your eyes only, BJ, with the obvious exception of your husband and any immediate family members who may be helping you with the aquarium are the care of the seahorses and other fish. Please don’t share the PDF file with the complete training program or the individual lessons with any other hobbyists or individuals without first obtaining my expressed permission to do so. Thanks for your cooperation! Best wishes with all your fishes, BJ! 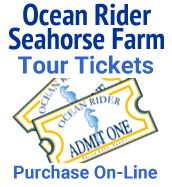 My wife and I just went on the tour of your seahorse farm and had a great time. I have three saltwater fish tanks with the oldest one that I started about 20 years ago. I would like to take the training course to learn more about keeping seahorses and possibly buying some from your farm. I sent you an e-mail with more information about my experiences with saltwater aquariums. Lynette Swantack for seahorse training. [email protected]. I just read the above post and I’m so excited that you are still doing the seahorse training! I am new to reefing. I bought a 16 gallon Biocube in Dec. It was cycled with live rock, live sand, and inverts. I have some coral: 2 zoas, 1 Duncan, 2 leathers, 1 gorgonian, 2 feathers, and 1 candy cane. All are healthy. I will be getting more gorgonians soon from my lfs. I also released copepods in the tank 10 days ago. I have had 2 hippo erectus for three weeks And feed them frozen Mysis shrimp by hand with an eyedropper. I tap on the tank and they come right over to me. They follow the Misys shrimp as it goes down the tube and will actually pull it out of the tip if I don’t squirt fast enough! I want to make sure that I take the best care of my ponies, That is why I want to take your course. Thank you in advance! Lynette Swantack again. I forgot to mention that I’ll be upgrading to a larger tank To accommodate more seahorses…from Ocean Rider! Lynette Swantack Here again. I am eagerly awaiting a reply regarding the seahorse training. I am cycling a larger second tank 32 gal right now. I apologize for taking so long to reply to your inquiry, but I was hospitalized for this reasonableness until recently, and now that I’m back home again, I am just starting to catch up on the backlog of messages that accumulated in my absence. Yes, of course, the seahorse training program is always available from Ocean Rider, completely free of charge. To get you started off on the right foot, Lynette, I will go ahead and send you the entire training course – all 10 lessons together in one file – in PDF format as an attachment to this e-mail. You can then download the attachment, save it on your computer, and read through the 10 lessons at your leisure, taking all of the time you need to go over the information and absorb the material. All we ask in return is that you stick with the highly domesticated Ocean Rider Mustangs or Sunbursts when you are finally ready to add ponies to your tank, Lynette. As you know, Mustangs and Sunbursts are the perfect ponies for beginners. They are hardy, highly adaptable, easy to feed, and perfectly adapted for aquarium life — the world’s only High-Health seahorses, guaranteed to be free of specific pathogens and parasites. The seahorse training program is very comprehensive, consisting of several hundred pages of text with more than 250 full-color illustrations, and it will explain everything you need to know in order to keep Ocean Rider seahorses successfully in a home aquarium. We require all first-time buyers and customers to complete the seahorse training manual before they make a purchase in order to assure that home hobbyists are well prepared to give our ponies the best possible care when they make a purchase. There is no charge whatsoever for these services. Be sure to save the PDF file with the seahorse training lessons on your computer for future reference, Lynette. It includes a detailed table of contents with page numbers, so that you can quickly locate the material or section you would like to go back and review at any time. Just remember that the lessons are for your eyes only, Lynette, with the obvious exception of your husband and any immediate family members who may be helping you with the aquarium or the care of the seahorses and other fish. Please don’t share the PDF file with the complete training program or the individual lessons with any other hobbyists or individuals without first obtaining my expressed permission to do so. Thanks for your cooperation! Best wishes with all your fishes, Lynette! Allow me to apologize once again for the delay in responding to your request about the seahorse training manual, sir. I am sorry that it’s taken this long to get back to you but the delay was unavoidable in this case. Now that I have recovered, of course, I am very happy to send you the entire training course – all 10 lessons together in one file – in PDF format as an attachment to this e-mail. You can then download the attachment, save it on your computer, Bruce, and read through the 10 lessons at your leisure, taking all of the time you need to go over the information and absorb the material. All we ask in return is that you stick with the highly domesticated Ocean Rider Mustangs or Sunbursts when you are finally ready to add more ponies to your tank, sir. As you know, Mustangs and Sunbursts are the perfect ponies for beginners. They are hardy, highly adaptable, easy to feed, and perfectly adapted for aquarium life — the world’s only High-Health seahorses, guaranteed to be free of specific pathogens and parasites. Be sure to save the PDF file with the seahorse training lessons on your computer for future reference, Bruce. It includes a detailed table of contents with page numbers, so that you can quickly locate the material or section you would like to go back and review at any time. Just remember that the lessons are for your eyes only, Bruce, with the obvious exception of any immediate family members who may be helping you with the aquarium or the care of the seahorses and other fish. Please don’t share the PDF file with the complete training program or the individual lessons with any other hobbyists or individuals without first obtaining my expressed permission to do so. Thanks for your cooperation! Best wishes with all your fishes, Mr. Fraser! I hope you are feeling better. I also sent you an e-mail about taking the course. It was sent in early February and my e-mail address is [email protected] in case that helps.